BMW E90 Coilovers and Wheel Spacers. The E90 platform is generally ranked somewhere in the middle for top 3 series platforms. The platform made it’s debut in 2005 and was the fifth generation of the beloved 3 series. The E90 platform ran from 2005-2012 and was acclaimed by many. The E90 received “World Car of the Year” in it’s first year of release, impressive. BMW’s generation 5 3 series (like most European luxury sedans) grew in size compared to it’s predecessor. Despite it’s larger dimensions it weighed no more than previous platforms though. This was due to BMW’s technology and usage of lightweight but strong materials. Looking back, the E90 was a successful platform despite what some think. Considering the E90’s birth took place when Mercedes, Audi, Lexus, etc. were proving to be tough competition in the luxury sports sedan class, between the convertible, touring, coupe, and sedan models, BMW sold just over 3,100,000 vehicles, not too shabby. Some have found the stock suspension system to be too stiff. Others have found it to be not stiff enough for a luxury sport sedan. Some owners of the sport suspension have said it is a happy medium, but can still be too much sometimes. 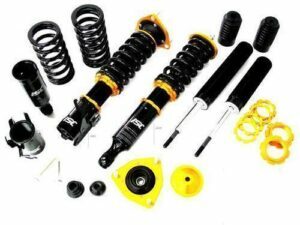 Regardless of what side you are on, there is a simple solution, adjustable coilovers, and ISC has your back! ISC Suspension now offers coilovers and wheel spacers for the BMW 3 series E90 platform. Not only are our coilovers 32 way adjustable, offered in multiple valving options, include upper mounts and camber plates, but we utilize top grade materials and back each set with a 5 year warranty!